Low–cost Al2O3-SiO2-CaO ceramic foams were prepared using a novel and simple reactive foaming process. The foamed green bodies were produced by mixing aluminium powder and calcium hydroxide in an aqueous solution of sodium silicate and sintered in an argon atmosphere using a pressureless electric current assisted process (T = 800 °C). An additional thermal treatment was performed in air using a conventional furnace (T = 1050 °C) in order to oxidize the residual metallic phases. The resulting foams exhibited open porosity, densities ranging from 0.50 to 0.65 g/cm3 and wide pore size distribution (0.04 – 400 μm). The compressive strength and thermal diffusivity of these foams ranged from 2.12 to 1.01 MPa and from 0.27 to 0.45 mm2s−1, respectively, which indicate their suitability as thermal insulator materials. Projects: Joint Mobility Project within Czech-Slovak scheme for the period 2018–2020 under the ASCR-SAS agreement. MVTS UltraCom within the scheme of Support of the Seal of Excellence projects. A rapid solidification process (melt spinning) was applied to the fluoride molten salt system (LiF–CaF2)eut–xLaF3 (x = 0, 5, 10, 20, and 30 mol%) with the aim to identify formed metastable phases. Two types of undercooled fragment were identified: riffle-like and sphere-like fragments that differ in morphology (Figure 1), but whose phase composition seems to be comparable. The phase composition of these rapidly cooled samples revealed the presence of a metastable fcc type phase based on (Ca0.65La0.35)F2.35 using SEM-EDX and S/TEM in contrast to when the system was spontaneously cooled, which showed only the presence of the initial components. The cell parameters of the metastable phase vary based on the composition and due to fast cooling (Figure 2). After thermal relaxation the metastable phase decomposes to CaF2 and LaF3 phases in accord to the phase diagram. It was demonstrated that the RSP method has real potential to reach thermally non-equilibrium states of solids, reflecting the ‘‘frozen’’ state of a liquid. For the first time ever the “through-space” indirect spin–spin couplings between hydrogen atoms formally separated by up to 18 covalent bonds have been detected by NMR experiments in model helical molecules. The direct distance between the interacting protons was about 3 Å. It has been demonstrated that this coupling can provide crucial structural information on the molecular conformation in solution. The coupling pathways have been visualised and analysed by computational methods. Based on this analysis the newly discovered phenomenon has been explained. The structures of the C2-symmetric pyrene oxahelicene (―)-(M,R,R)-1, its asymmetrical analogue (―)-(M,R,R)-2, and the smaller model compound (―)-(M,R,R)-3. The pyrene subunits A (blue) and B (black) in 2 are shown in different colours, as is the central part C (green). The helix pitch of the molecule is indicated by a red arrow, and the helical backbone is highlighted in grey. DRAČÍNSKÝ, Martin – BUCHTA, Michal – BUDĚŠÍNSKÝ, Miloš – VACEK-CHOCHOLOUŠOVÁ, Jana – STARÁ, Irena G. – STARÝ, Ivo – MALKINA, Oľga. 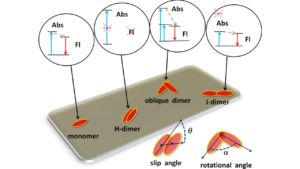 Dihydrogen contacts observed by through-space indirect NMR coupling. In Chemical Science, 2018, vol. 9, no. 38, p. 7437-7446. (9.063 – IF2017). ISSN 2041-6520. Glass microspheres with a composition of yttrium aluminate garnet were used to prepare translucent YAG glass/ceramic via non-traditional preparation procedure. 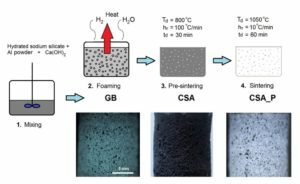 During the sintering, free surfaces were eliminated by viscous-flow sintering in hot-press between glass transition temperature Tg and onset of the crystallization temperature Tx (so-called kinetic window), which was below 900 °C. However, glasses with YAG composition have a narrow kinetic window and crystallize rapidly at temperatures Tx According to DSC measurements between Tg inflection and Tx onset is only 52 °C, and therefore precise optimization of the sintering was required. 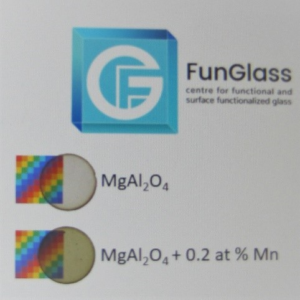 The YAG glass-ceramic glass with the relative density over 94 % was successfully prepared at a temperature below 900 °C, dwell time only one minute and pressure 40 MPa. 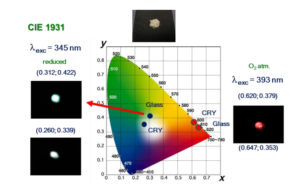 Glass microspheres with Y3Al5O12 composition were used to prepare translucent sample at temperature lower than 900°C. Magnesium-aluminate spinel MgAl2O4 is particularly noteworthy due to its importance as a host material for transition metals in solid-state lasers. Due to its cubic crystal lattice spinel can be used for the preparation of transparent ceramic; however, transparency in these polycrystalline materials is ensured by the absence of light scattering sites (pores, secondary phases) to avoid energy dissipation within the material. Preparation of transparent material, therefore, requires high density defect-free green body with following application of high temperature and pressure, for example, hot-isostatic press. In the frame of SAS-MOST JRP2015/6 project, a technological procedure of direct one-step densification of commercial spinel powder into transparent polycrystalline spinel ceramic doped with manganese ions was developed (Fig. 1). Transparent polycrystalline spinel MgAl2O4 and Mn2+-doped spinel prepared by SPS sintering technique at 1250°C and axial pressure of 80 MPa. Adsorption of organic cations on the surface of negatively charged particles is a one of traditional scientific topics attracting scientific community. In recent years, it has been found that adsorption can be considerably more complex in terms of mechanisms than had been expected. 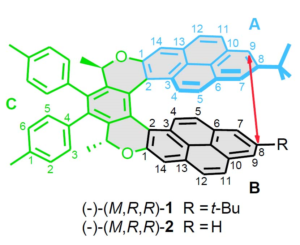 Partial steps of adsorption revealing the reaction mechanism and intermolecular interactions of adsorbed cations can be described in real time using organic dye cations with sensing properties . Typically, the first, rapid step of adsorption is followed by slower processes that correspond to migration, rearrangement of organic cations, and the formation of various types of molecular assemblies. These changes can be effectively described by the photophysical phenomenon called metachromasia . In many cases, the amount of cationic molecular aggregates causing the metachromasia increases with the surface concentration of adsorbed cations [2-4]. However, it has been found that in some cases the surface concentration may also have the opposite effect . Colloid destabilization and the formation of particle agglomerates significantly affect the migration of dye cations on the surface of the particles. This may lead to a reduction in the rate of cation diffusion and to the limitation of the formation of some types of dye molecular aggregates . Interestingly, these phenomena depend not only on the molecular structure of organic cations, but are also significantly affected by the surface properties of the particles . Types of dye molecular aggregates formed on the surface of layered particles and the relationship between their spectral properties and structure. 1. BUJDÁK, J.The effects of layered nanoparticles and their properties on the molecular aggregation of organic dyes. In Journal of Photochemistry and Photobiology C: Photochemistry Reviews, 2018, vol. 35, p. 108-133. (15.325 – IF2017). In this work dense alumina (Al2O3) composites with homogeneously distributed MWCNTs were prepared by freeze granulation and rapid hot press. On such prepared composites influence of carbon nanotubes (CNTs) addition on functional properties and basic electro-discharge machining characteristics were studied. In case of composites Al2O3-MWCNT electrical conductivity significantly increased (about 13 order of magnitude) from 10-10 S/m (pure Al2O3) to 1748 S/m for composite with addition of 12.5 vol. % CNTs. Improvement of electrical conductivity allow us to machine these materials by WEDM (Wire electro-discharge machining). Material removal rate increased with increasing content of MWCNTs and therefore with increasing electrical conductivity, the highest value of MRR = 11 mm3/s for composite with 12.5 vol. % of MWCNTs was reached. Moreover, using multi-pass WEDM process result in decrease of surface roughness after machining. Variation of surface roughness of alumina-MWCNTs composites after singlepass (a) and fivepass (b) electro-discharge machining. SINGH, M.A. – SARMA, D.K. – HANZEL, O. – SEDLÁČEK, J. – ŠAJGALÍK, P. Surface characteristics enhancement of MWCNT alumina composites using multi-pass WEDM process. In Journal of the European Ceramic Society, 2018, vol. 38, p. 4035-4042. SINGH, M.A. – SARMA, D.K. – HANZEL, O. – SEDLÁČEK, J. – ŠAJGALÍK, P. Surface characteristics and erosion phenomena in WEDM of alumina composites. In Materials and Manufacturing Processes, 2018, vol. 33, p. 1815-1821. When studying molecules containing heavy elements it is necessary to include relativistic effects in the quantum chemical theory. Particularly challenging are systems with a non-degenerate ground state, so-called paramagnetic systems. These molecules appear in wide variety of scientific fields, for instance in the development of new magnetic materials (data storage), in studies of biological systems (metal-based drugs), and in nuclear waste treatment. One of the many challenges of relativistic quantum chemistry is the characterization of the configuration of quantum states when studying paramagnetic substances. In the non-relativistic domain, this is achieved by referring to the spin multiplicity of the system. However, this option is not available in the relativistic domain, since spin is not a good quantum number any more. One usually resorts, therefore, to the effective spin; or, equivalently, to the formal degeneracy of the ground and excited states. By accident, we have discovered a new quantum number in the relativistic theory of many-electron systems. This newly-discovered fundamental law has the potential to influence whole research fields dealing with heavy-element-containing paramagnetic systems. and the recently discovered quantum number k.
KOMOROVSKÝ, S. – REPISKÝ, M. – BUČINSKÝ, L. New quantum number for the many-electron Dirac-Coulomb Hamiltonian. In Physical Review A, 2016, vol. 94, p. 052104-1-052104-14. (2.765 – IF2015). In this work dense alumina (Al2O3) or silicon carbide (SiC) composites with addition of carbon nanostructures (carbon nanotubes – CNT, or graphene nanoplatelets – GNP) were prepared by a new approach. This process comprises functionalisation of carbon nanostuctures, their stabilisation in suspension, and subsequent spraying of the stable suspension into liquid nitrogen. The influence of carbon nanostructures addition and effect of graphene layers orientation on the functional properties (electrical and thermal conductivity) of the composites thus prepared was studied. In the case of Al2O3-CNT composites the electrical conductivity significantly increased (by about 13 orders of magnitude) from 10-10 S/m for pure Al2O3 to 1748 S/m for the composite incorporating 12.5 vol.% of CNTs. The SiC-GNP composites exhibited electrical conductivity of up to 1775 S/m, an increase of about 5 orders of magnitude over the base material. The improvement of electrical conductivity can be attributed to the preparation method, which allows the homogeneous distribution of the carbon nanostructures to be preserved. As a result, carbon nanostructures formed conductive networks in the ceramic matrix. Ceramic composites with high electrical conductivity can be machined by the electrical discharge machining (EDM) process. Effective machining of prepared composites was confirmed for composites with ≥ 7.5 vol.% of CNTs. Y2O3-Al2O3 and Y2O3-Al2O3-SiO2 glasses were prepared in the form of glass microspheres from precursor powders by the flame-spraying method. The precursor powders were synthethised by the sol-gel Pechini method to achieve better homogeneity of the system. The prepared glasses were doped with rare-earth and transition metal ions with photoluminescence properties suitable for LED diodes in applications requiring emission of white light, e.g. Ce3+, Mn2+ at low concentration. The glass-ceramics material prepared by controlled crystallization of Ce3+-doped glasses at low concentration exhibits strong green-yellow emission under blue light, comparable with commercial phosphors. Moreover, heat treatment of the glass under suitable time-temperature regimes leads to emission of white light under NUV excitation. Co-doping of the Ce3+ system with Mn2+ ions enables the preparation of phosphors with improved emission in the orange-red region of the spectrum. irradiated by NUV light at 345 nm. Potassium oxo- and oxo-fluoro-aluminates are new materials with interesting charge-related and optical properties. Understanding the unusually high transport properties of these materials requires more rigorous characterization of all phases existing in these systems. For this reason, a critical evaluation of the chemistry and the phase stability of the system KF−Al2O3 was performed. The system cannot be interpreted as a simple binary system, but represents the stable diagonal of the ternary reciprocal system KF–Al2O3–AlF3–K2O. It was discovered that this system contains many pure complex compounds – e.g. K3AlF6, K2O × 1, 9 and 11Al2O3, and K2Al2O3F2. 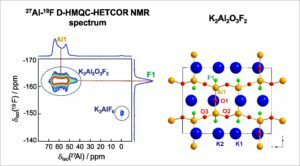 The highlight of the work is the identification of a structural coherence between oxyaluminates of mullite type K2O×xAl2O3 (where x = 3-12) and oxy-fluoro-aluminates, which was determined, in particular, with the help of new NMR techniques. The structural characterization, using various solid state NMR techniques, including MQMAS and D-HMQC, has provided new and clearer insight into the links between the structures of individual existing complexes. Deconvolution of 27Al and 19F NMR signals of pure K2Al2O3F2 using 27Al–19F D-HMQC HETCOR MAS NMR analysis of 2KF/1Al2O3. ŠIMKO, F. – RAKHMATULLIN, A. – FLORIAN, P. – KONTRÍK, M. – KORENKO, M. – NETRIOVÁ, Z. – DANIELIK, V. – BESSADA, C. (Oxo)(fluoro)-aluminates in KF-Al2O3 system: thermal stability and structural correlation. In Inorganic Chemistry, 2017, vol. 56, no. 21, p. 13349-13359. (4.857 – IF2016). Increasing dyes surface concentration and its influence on the photophysical properties of the hybrid nanomaterials. BELUŠÁKOVÁ, S. – MARTÍNEZ-MARTÍNEZ, V. – LOPEZ ARBELOA, I. – BUJDÁK, J. Resonance energy transfer between dye molecules in colloids of a layered silicate. The effect of dye surface concentration. In Journal of Physical Chemistry C, 2017, 121, p. 8300-8309. (4.536 – IF2016). This is the first work that applies so-called „flash“ (ultra-rapid) processing to joining of ceramic materials (carbon fibre / silicon carbide), thus allowing „flash joining“ of ceramics. During the process, electric current passes directly through the joining assembly and heats it up. The maximum shear strength of the joint was obtained when the process was performed in just 8 s using a maximum heating power of 2.2 kW, raising the temperature to 1237°C. The extremely rapid heating rate (9 600°C/min) and very short processing time (~ 8 s) suppressed diffusion between the base materials and the interlayers. A sound joint was obtained by forming a metallic kind of joint (Ti-based) at the joining temperature, in which the absence of any reaction phase significantly shortened the time necessary for the solid-state diffusion bonding. This has significant potential as a new joining mechanism of fibre-reinforced ceramic matrix composites (CMCs). When compared to the standard joining procedures (with a typical process time of ~ 1 h and temperature of 1700°C for the same interlayer and base materials), this newly developed „flash joining“ technique displays a significant reduction in processing time and maximum temperature required, which in turn leads to energy savings, making it potentially attractive for industry. TATARKO, P. – GRASSO, S. – SAUNDERS, T.G. – FERRARIS, M. – REECE, M.J. Flash joining of CVD-SiC coated Cf/SiC composites with a Ti interlayer. In Journal of the European Ceramic Society, 2017, 37, 3841-3848. (3.454 – IF2016). Our project proposal called for lab development and techno-economic analysis of a new eco-economic process for production of magnesium with solar thermal input. Energy requirements for the process were based on thermodynamics and an extrapolation of laboratory measurements of the electrochemical kinetic and mass transport parameters (electrode potentials, diffusion coefficients, exchange current densities, electrolyte conductivity) via a finite-element numerical model. The result of the project was the design of a completely new technology for the production of primary magnesium, which is environmentally sensitive and economically competitive in relation to the currently-dominant thermal Pidgeon process. The project has recently been converted into an up-scale test (1000 A, 1000 hours), funded by the US DOE and performed at the Materials and Electrochemical Corporation, Tuscon, Arizona. LEONARD, N. – KORENKO, M. – LARSON, C. – BLOOD, K. – VENTROM, L.J. – NUDEHI, S. – DUNCAN, S. – DIVER, R. – ŠIMKO, F. – PRIŠČÁK, J. – SCHOER, J. – KISSINGER, P.T. – PALUMBO, R. The thermal electrolytic production of Mg from MgO: A discussion of the electrochemical reaction kinetics and requisite mass transport processes. In Chemical Engineering Science, 2016, vol. 148, p. 155-169. (2.750 – IF2015). KORENKO, M. – LARSON, C. – BLOOD, K. – PALUMBO, R. – NUDEHI, S. – DIVER, R. – BLOOD, D. – ŠIMKO, F. – VENSTROM, L.J. 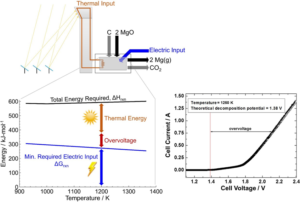 Technical and economic evaluation of a solar thermal MgO electrolysis process for magnesium production. In Energy, 2017, vol. 135, p. 182-194. (4.520 – IF2016).